Seqenenre Tao (also Seqenera Djehuty-aa or Sekenenra Taa), called 'the Brave', ruled over the last of the local kingdoms of the Theban region of Egypt in the Seventeenth Dynasty during the Second Intermediate Period. He probably was the son and successor to Senakhtenre Ahmose and Queen Tetisheri. The dates of his reign are uncertain, but he may have risen to power in the decade ending in 1560 BC or in 1558 BC (based on the probable accession date of his son, Ahmose I, the first ruler of the eighteenth dynasty, see Egyptian chronology). With his queen, Ahhotep I, Seqenenre Tao fathered two pharaohs, Kamose, his immediate successor who was the last pharaoh of the seventeenth dynasty, and Ahmose I who, following a regency by his mother, was the first pharaoh of the eighteenth. Seqenenre Tao is credited with starting the opening moves in a war of revanchism against Hyksos incursions into Egypt, which saw the country completely liberated during the reign of his son Ahmose I. New Kingdom literary tradition states that Seqenenre Tao came into contact with his Hyksos contemporary in the north, Apepi or Apophis. The tradition took the form of a tale in which the Hyksos king Apepi sent a messenger to Seqenenre in Thebes to demand that the Theban hippopotamus pool be done away with, for the noise of these beasts was such that he was unable to sleep in far-away Avaris. Perhaps the only historical information that can be gleaned from the tale is that Egypt was a divided land, the area of direct Hyksos control being in the north, but the whole of Egypt paying tribute to the Hyksos kings. Seqenenre Tao participated in active diplomatic posturing, which went beyond simply exchanging insults with the Asiatic ruler in the North. He seems to have led military skirmishes against the Hyksos and, judging from the vicious head wounds on his mummy in the Cairo Museum, may have died during one of them. His son and successor Wadjkheperre Kamose, the last ruler of the seventeenth dynasty at Thebes, is credited with launching a successful campaign in the Theban war of liberation against the Hyksos, although he is thought to have died in the campaign. 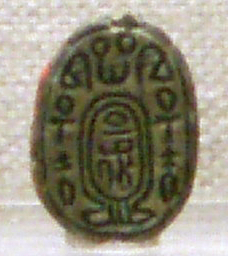 His mother, Ahhotep I, is thought to have ruled as regent after the death of Kamose and continued the warfare against the Hyksos until Ahmose I, the second son of Seqenenre Tao and Ahhotep I, was old enough to assume the throne and complete the expulsion of the Hyksos and the unification of Egypt. The relatively short length of the reign of Seqenenre Tao did not allow for the construction of many monumental structures, but it is known that he had built a new palace made of mud brick at Deir el-Ballas. On an adjacent hillside overlooking the river, the foundations of a building were found that almost certainly was a military observation post. A relatively large amount of pottery known as Kerma-ware was found at the site, indicating that a large number of Kerma Nubians were resident at the site. It is thought that they were there as allies of the pharaoh in his wars against the Hyksos. Seqenenre's mummy was discovered in the Deir el-Bahri cache, revealed in 1881. He was interred along with those of later, eighteenth and nineteenth dynasty leaders, Ahmose I (his second son to be pharaoh), Amenhotep I, Thutmose I, Thutmose II, Thutmose III, Ramesses I, Seti I, Ramesses II, and Ramesses IX. Professor Gaston Maspero resigned his office of directorship on June 5, 1886, and was succeeded in the superintendency of excavations and Egyptian archeology by M. Eugene Grebault. In the same month Grebault started upon the work of unbandaging the mummy of the Theban King Sekenenra Ta-aken, of the eighteenth dynasty. It was under this monarch that a revolt against the Hyksos, or Shepherd Kings, had originated, in the course of which the Asiatics were expelled from Egypt. The history of this king has always been considered legendary, but from the signs of wounds present in the mummy, it is certain that he had died in battle. In the same season the mummy of Seti I was unbandaged, and also that of an anonymous prince. ...it is not known whether he fell upon the field of battle or was the victim of some plot; the appearance of his mummy proves that he died a violent death when about forty years of age. Two or three men, whether assassins or soldiers, must have surrounded and despatched him before help was available. A blow from an axe must have severed part of his left cheek, exposed the teeth, fractured the jaw, and sent him senseless to the ground; another blow must have seriously injured the skull, and a dagger or javelin has cut open the forehead on the right side, a little above the eye. His body must have remained lying where it fell for some time: when found, decomposition had set in, and the embalming had to be hastily performed as best it might. The wound on his forehead was probably caused by a Hyksos axe and his neck wound was probably caused by a dagger while he was prone. There are no wounds on his arms or hands, which suggests he was not able to defend himself. Until 2009 the main hypotheses have been that he died either in a battle against the Hyksos or was killed while sleeping. A reconstruction of his death by Egyptologist Garry Shaw and archaeologist and weapons expert Robert Mason suggested a third, which they saw as the likeliest, that Seqenenre was executed by the Hyksos king. Garry Shaw also analysed the arguments for the competing hypotheses and other physical, textual and statistical evidence concluding "that the most likely cause of Seqenenre’s death is ceremonial execution at the hands of an enemy commander, following a Theban defeat on the battlefield." His mummy appears to have been hastily embalmed. X-rays that were taken of the mummy in the late-1960s show that no attempt had been made to remove the brain or to add linen inside the cranium or eyes, both normal embalming practice for the time. In the opinion of James E. Harris and Kent Weeks who undertook the forensic examination at the time the x-rays were taken, his mummy is the worst preserved of all the royal mummies held at the Egyptian Museum, and they noted that a "foul, oily smell filled the room the moment the case in which his body was exhibited was opened", which is likely due to the poor embalming process and the absence of the use of absorbing natron salts, leaving some bodily fluids in the mummy at the time of burial. He is the earliest royal mummy on display in the recently revamped (2006) Royal Mummies Hall at the Egyptian Museum, Cairo. ^ Shaw, Ian. The Oxford History of Ancient Egypt. Oxford University Press, 2000. p.198. ^ a b Shaw, Ian. The Oxford History of Ancient Egypt. Oxford University Press, 2000. p199. ^ Rappoport, S. The Project Gutenberg EBook of History Of Egypt From 330 B.C. To The Present Time, Volume 12 (of 12), by S. Rappoport. The Grolier Society Publishers, London. Archived from the original on 4 March 2016. Retrieved 31 October 2016. ^ Shaw, Ian. The Oxford History of Ancient Egypt. p199. Oxford University Press, 2000. ^ "Axe Experiment". Museum Secrets. History Television. Archived from the original on 17 March 2012. Retrieved 31 August 2011. ^ Shaw, Garry J. (2009). "The Death of King Seqenenre Tao". Journal of the American Research Center in Egypt. 45. ^ Harris, James E., Weeks, Kent R. X-raying the Pharaohs . Charles Scribner's Sons. 1973. SBN 684-13016-5 p.122-123. ^ Hawass, Zahi. Dancing with Pharaohs: The New Royal Mummies Halls at the Egyptian Museum, Cairo. KMT, Volume 17, Number 1, Spring 2006. p22. Gardiner, Sir Alan. Egypt of the Pharaohs . (Oxford, 1964). Hayes, William C. Egypt: From the Death of Ammenemes III to Sequenenre II," in Volume 2, Chapter 2 of the "Cambridge Ancient History", Revised Edition (Cambridge, 1965). Pritchard, James B. (Editor). Ancient Near Eastern Texts Relating to the Old Testament. Third Edition, with Supplement. (Princeton, 1969). Wikimedia Commons has media related to Seqenenre Tao. Ahmose I was a pharaoh and founder of the Eighteenth Dynasty of Egypt. He was a member of the Theban royal house, the son of pharaoh Seqenenre Tao and brother of the last pharaoh of the Seventeenth dynasty, Kamose. During the reign of his father or grandfather, Thebes rebelled against the Hyksos, the rulers of Lower Egypt. When he was seven years old, his father was killed, and he was about ten when his brother died of unknown causes after reigning only three years. Ahmose I assumed the throne after the death of his brother, and upon coronation became known as nb-pḥtj-rꜥ "The Lord of Strength is Ra". The Second Intermediate Period marks a period when Ancient Egypt fell into disarray for a second time, between the end of the Middle Kingdom and the start of the New Kingdom. Ahmose, son of Ebana, served in the Egyptian military under the pharaohs Ahmose I, Amenhotep I, and Thutmose I. His autobiography has survived and is intact on the wall of his tomb and has proven a valuable source of information on the late 17th Dynasty and the early 18th Dynasty of Egypt. Kamose was the last king of the Theban Seventeenth Dynasty. He was possibly the son of Seqenenre Tao and Ahhotep I and the full brother of Ahmose I, founder of the Eighteenth Dynasty. His reign fell at the very end of the Second Intermediate Period. Kamose is usually ascribed a reign of three years, although some scholars now favor giving him a longer reign of approximately five years. Sharuhen was an ancient town in the Negev Desert or perhaps in Gaza. Following the expulsion of the Hyksos from Egypt in the second half of the 16th century BCE, they fled to Sharuhen and fortified it. The armies of Pharaoh Ahmose I seized and razed the town after a three-year siege. Senakhtenre Ahmose was the seventh king of the Seventeenth dynasty of Egypt during the Second Intermediate Period. Senakhtenre reigned for a short period over the Theban region in Upper Egypt at a time where the Hyksos 15th dynasty ruled Lower Egypt. Senakhtenre died c.1560 or 1558 BC at the latest. Apepi or Apophis was a ruler of Lower Egypt during the fifteenth dynasty and the end of the Second Intermediate Period that was dominated by this foreign dynasty of rulers called the Hyksos. According to the Turin Canon of Kings, he ruled over the northern portion of Egypt for forty years. He ruled during the early half of the 16th century BC and outlived his southern rival, Kamose, but not Ahmose I. Although his reign only entailed northern Egypt, Apepi was dominant over most of Egypt during the early portion of his reign, and traded peacefully with the native Theban Seventeenth dynasty to the south. Ahhotep I was an Ancient Egyptian queen who lived circa 1560–1530 BC, during the end of the Seventeenth Dynasty of Egypt. She was the daughter of Queen Tetisheri and Senakhtenre Ahmose, and was probably the sister, as well as the queen consort, of Pharaoh Seqenenre Tao ll. Ahhotep I had a long and influential life. She ruled as regent for her son Ahmose I for a time. Ahhotep II was an Ancient Egyptian queen, and likely the Great Royal Wife of Pharaoh Kamose. Ahmose-Sapair was an ancient Egyptian prince of the late Seventeenth Dynasty. He was probably a son of Pharaoh Seqenenre Tao and a brother of Ahmose I or the child of Ahmose I.
Ahmose was a princess of the Seventeenth Dynasty of Egypt. She was the only known daughter of Seqenenre Tao by his sister-wife Sitdjehuti. She was the half-sister of Pharaoh Ahmose I and Queen Ahmose-Nefertari. Her titles are King's Daughter; King's Sister.